Power Momentum Indicator when matched with a Trend Shift cross is a prediction of a strong move in the direction of the implied shift. Note the Chart above with lower left display box projecting a Long Watch at 166.24. 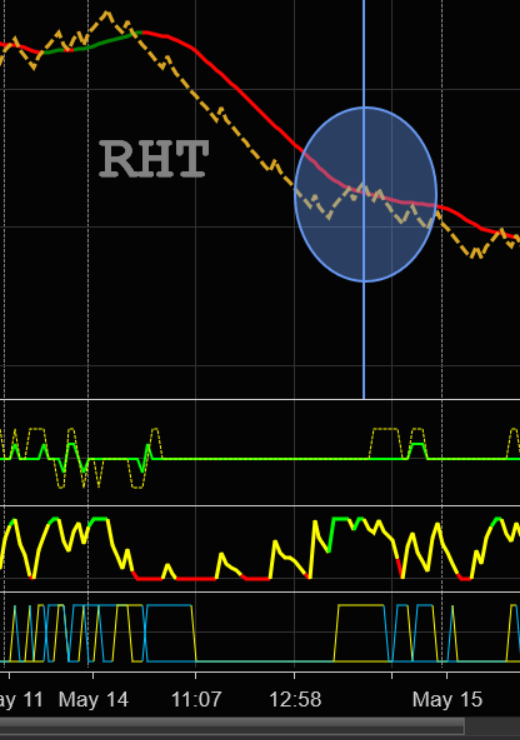 This started a Trend Shift Watch on RHT at that time, as you can see from zoom on the chart to the right, the Trend Shift never trigger and the stock price continued lower. This is the core of the Trading Package. Our Proprietary System projects forward price action and as it does adjust the Long Watch Trigger Price accordingly. In this case the long trigger, even as projected at lower prices, never triggered. But notice the Trend Shift Trigger Long Watch Prices in each of the displays in the lower left corner of each chart below. As the price action continued to base and consolidate 1st the Long Watch was at 166.24, then our projection modified the Long Watch Trigger Price to 165.99, then after further consolidation our projection modified to a even lower Long Watch Trigger Price of 165.24. As the price continued lower the Long Watch display box was totally removed from the chart, as our proprietary indicator could no longer project a trend shift within a 2 x factor price range. 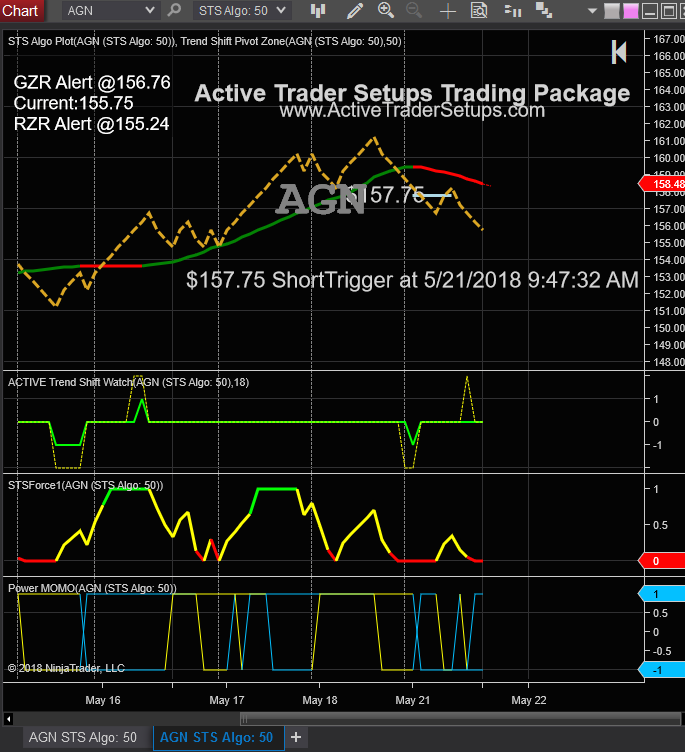 In the above Chart after the Short Trigger of 157.75, which at that exact price and time the Green Trend Shift plot changed color to Red to indicate the now implied bearish Down Trend. 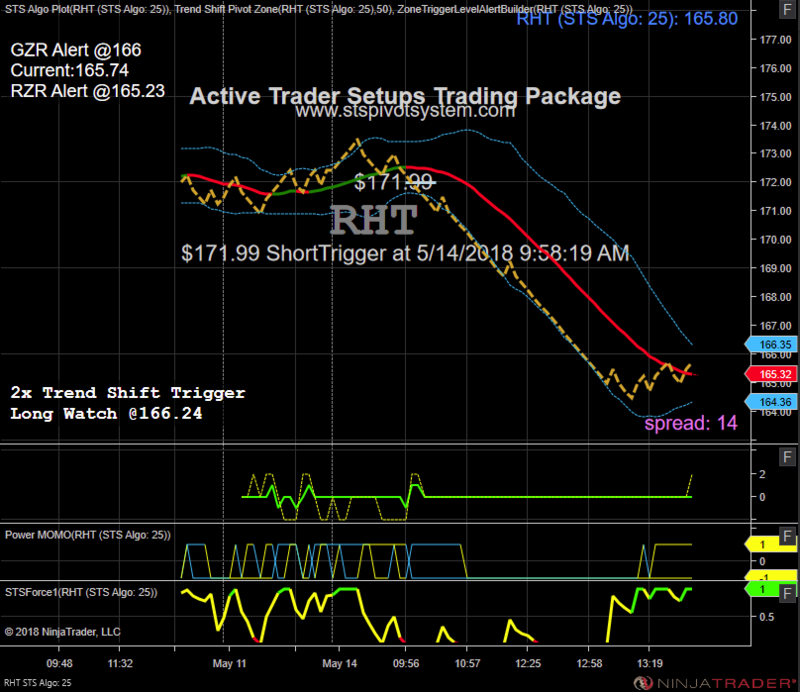 If you were watching this chart as it retraced back up about 1.50 and were preparing to enter a Short Trade you can refer to the display box and the RZR Alert will show the require price to reverse the price plot back to the downward direction and resume the indicated down trend setup. 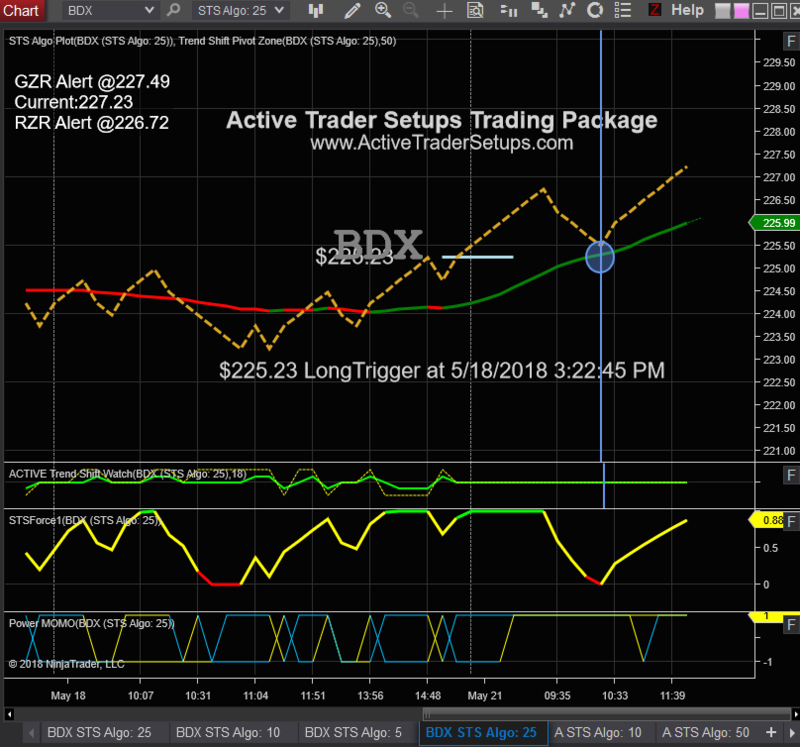 RZR is Red Zone Retracement. The Trend Plot is Red, so we are in a Red Zone or implied down trend, the retracement is the rise in price back toward the Red Line Plot and not exceeding the Line with the price plot. 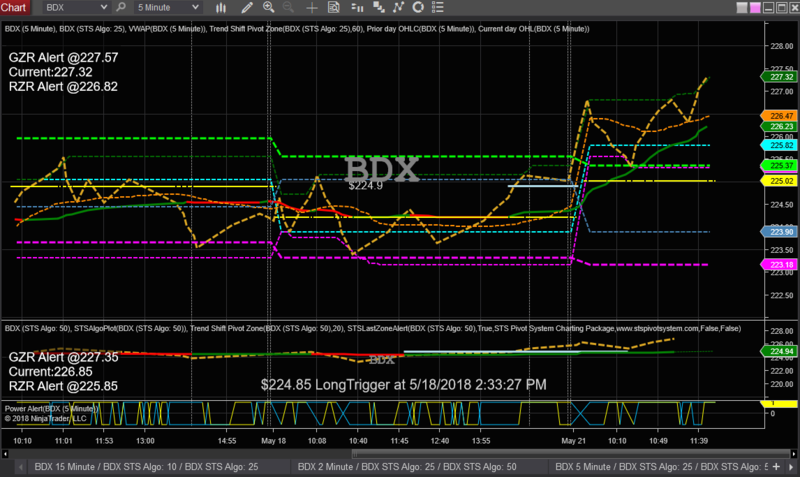 The above chart on BDX is a Green Zone Retracement and the GZR Alert price gave the alert price to confirm the price resuming the implied uptrend. 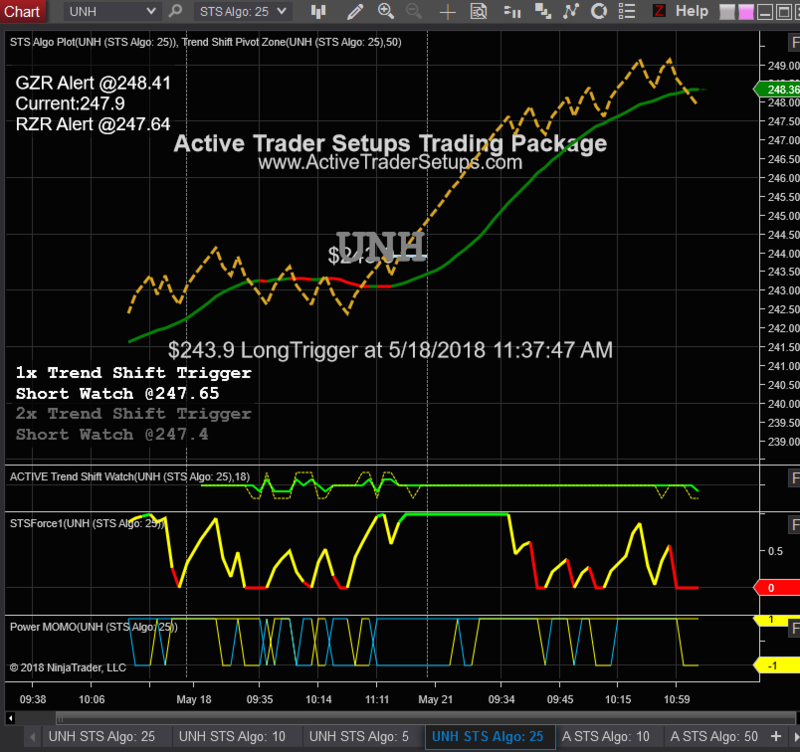 Please note the Blue Vertical line in the lower area there is not a Up peak in the green line of the ACTIVE Trend Shift Watch - this means there was never a lower left display box with a posted Trend Shift Short Watch Price. This implies the strength of this current Up Trend and a Higher Probability that the reversal will occur. As the pull back retracement occurred note the price plot held the Green dotted line with a value of 225.37 shown in the right margin of the chart. That line represents yesterday's High of Day, previous short term Resistance now becomes today's short term Support or an expected Inflection point that has aligned with our Green Zone Retracement. With the help of the Inflection point chart a low risk early entry can be made be a day trader. 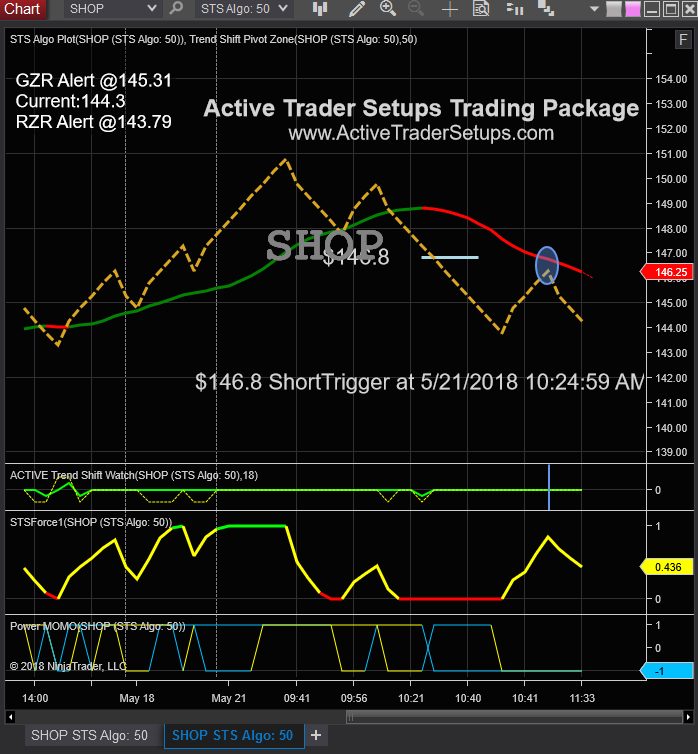 The above chart on SHOP is a Red Zone Retracement and the RZR Alert price gave the alert price to confirm the price resuming the implied down trend. Please not the Blue Vertical line in the lower area there is not a Down peak in the green line of the ACTIVE Trend Shift Watch - this means there was never a lower left display box with a posted Trend Shift Long Watch Price. This implies the strength of this current Down Trend and a Higher Probability that the reversal will occur.